10/100/1000 Copper to Optical Conversion nTAP | VIAVI Solutions Inc.
For single-receive devices, Observer Aggregator Conversion nTAPs merge full-duplex links into single streams for transmission to up to two single-receive analysis devices. Industry-leading buffer sizes offer less likelihood of lost packets than SPAN ports to ensure critical traffic reaches analyzers, remote monitoring appliances, and forensics tools. Place a 10/100/100 Copper to Optical Conversion nTAP between two devices of interest on a 100 Mbps or 1000 Mbps copper link. 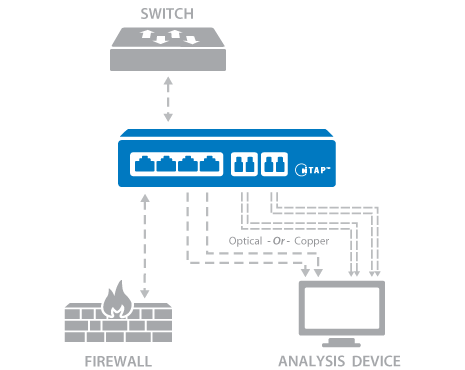 Then attach either a copper or optical monitoring device to the nTAP. Only one analyzer connection can be utilized at a time. To successfully analyze the full-duplex link, the monitoring device must be equipped with a dual-receive capture card.